(VOVWORLD) - Prime Minister Nguyen Xuan Phuc said Vietnam always considers the US a key partner and wants to strengthen the comprehensive partnership between the 2 countries in an effective and practical manner. 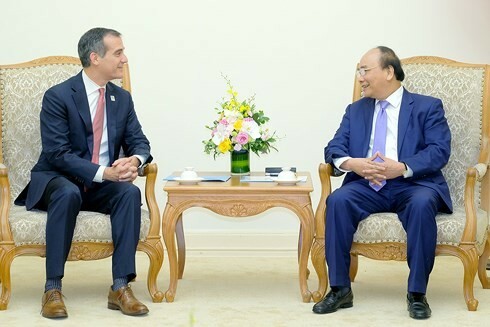 Prime Minister Nguyen Xuan Phuc receives Los Angeles Mayor Eric Garcetti in Hanoi on July 28, 2018. While receiving Los Angeles Mayor Eric Garcetti on Saturday in Hanoi, Mr. Phuc also welcomed the opening of a direct air route between Vietnam and Los Angeles in the near future. The Prime Minister urged the US to recognize Vietnam’s market economy status, further open its market for Vietnamese goods, and minimize trade and non-trade barriers. He also asked California to create the best conditions for the local Vietnamese community.